This is a recipe that combines the flavours of the autumn garden and turns an oft neglected vegetable into a delicate delight. Use any or all of the following ingredients depending on what the garden is currently yielding. Spinach, Arugula, Beet Tops, or any other seasonal leafy veg. Basically, what I call "once around the garden" to see what’s tasty and many vegetables are better tasting and more nutritious when eaten raw. This is hard to quantify as I tend to add what ever herbs are abundant in the garden. The favourites are Basil, (plain, Lemon or Lime varieties,) Tarragon, Cilantro, and almost always, chives regular or garlic. Chop up more than you think is enough, so that the flavour is noticeable. Good quality Olive oil is essential, then add about one third as much Lemon, (or sometimes Lime,) juice. Whisk these two until they thicken. Add my secret ingredient, a couple of tablespoons of Maple Syrup. Mix in the chopped herbs and add a little freshly ground pepper. I rarely use salt but that is a personal preference. A variety of cheeses can be crumbled or grated directly into the bowl or mixed in with the dressing. Romano, Feta, and Stilton are what I might use depending on my whim. Be creative, that’s what cooking is all about. On a hot night use some cooked crab or lobster and chop it into chunks. On a cooler night I will put the some of the olive oil in a pan and fry up some sausage that I have sliced 1cm thick. You can vary the sausage to vary the salad. My butcher makes a great sun dried tomato sausage or if I’m more adventurous a hot lamb Merguez . When the sausage is almost cooked add the rest of the dressing and stir until it is all nicely warmed. Pour over the greens, toss lightly and serve immediately. 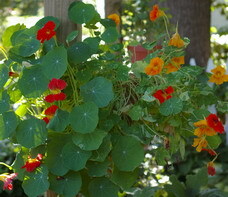 Garnish the top of the salad with colourful Nasturtium flowers (pictured at the top) and serve with a fresh baguette and crisp white wine while sitting on the deck surrounded by the beauty of your garden.